Why did you join NVMdurance? I knew NVMdurance because of my time with Micron, an NVMdurance customer, and I always thought their approach and technology was very compelling. I enjoy enabling new products and developing new markets, and the timing seemed right with where we are going with Pathfinder, Navigator and now Aviator. We are at the tip of the iceberg of the flash disruption in storage and NVMdurance provides unique solutions to enable this. How long were you with Micron? I was with Micron for almost 15 years in a variety of marketing related roles. I have 30 years semiconductor industry experience having started work in the memory area the year NAND flash was invented – 1987! My last role in Micron was Director of NAND Flash Marketing before I moved to NVMdurance at the end of 2016. 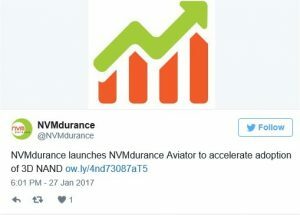 What is the NVMdurance Aviator? To put it simply, as it is very technical, NVMdurance Aviator enables deployment of 3D NAND flash memory in the most challenging applications. NAND is used in many applications, including Solid State Drives (SSD) mobile phones, tablets, USB drives and flash cards. 3D NAND is the new up and coming flash memory that users of flash want to deploy for a number of reasons including higher capacities, better performance and it promises a lower cost per gigabyte in the not too distant future. However, there are challenges for launching a product such as an SSD using 3D NAND. And without going into the technical details, these challenges to date have only been overcome by companies with large teams of people with deep flash expertise, using very manual methods. NVMdurance Aviator automates that process saving capital expense – human and hardware test equipment, and it allows our customers to get their product to market much quicker. We developed this product with Micron, and so NVMdurance is initially offering NVMdurance Aviator to companies using Micron’s 3D TLC NAND, such as SSD manufacturers. We are currently going through a round of funding and are developing an even richer set of tools to enable flash in more applications, including developing solutions that work with a broader range of flash vendors. So more of that to come later in the year. How do you plan to market the product? Well we started with a press release and we continue with analyst briefings over the next week or so. We will of course use social media – we are on Twitter, LinkedIn and Google Plus. We will inform our database also in our next newsletter. In addition to this broad reaching effort, we are also visiting target customers to talk to them about our solutions. We know from talking to some already that they are struggling with 3D NAND and NVMdurance Aviator can help. Our target customers cover the 3D NAND ecosystem ranging from the flash manufacturers, to SSD controller suppliers, to those deploying 3D-based solutions, including suppliers of SSDs and all-flash arrays. From your previous roles what were successful marketing campaigns, and why did they work well? We did a lot of different campaigns in Micron. However Flash Memory Summit (held each August in Santa Clara) was a key element of our marketing activities. It worked well because FMS is the one place you are guaranteed to have your partners, customers and target market in the same location for 3 days. This holds true for NVMdurance. Now that we are in a time of much more inbound marketing focused campaigns, what will your strategies be to convey to the wider world why they should be interested in the particular product you are promoting? As I mentioned, our target market is highly technical and our solution is somewhat specialized. However, the memory and storage markets are huge and broad-reaching, and people outside the industry follow these markets. I bet most of them are not aware of all of the struggles that industry and ecosystem are experiencing trying to manufacture 3D NAND and get to market with solutions using 3D NAND. This is part of our story. We solve a big problem in the industry with Aviator. Therefore, we must absolutely continue to talk with the flash storage analysts and press. We also will continue to have our customers talk about us. We have used case studies in the past (Altera) and will continue to do so. Some of our partners, for example, the NAND and controller suppliers, are also targeting the same customers with their products and can help promote our solutions as well. Who do you follow for marketing insights and inspiration? I wouldn’t want to name specific names for fear I might forget someone, but there are several media outlets and analysts that cover the flash storage market and do a fantastic job providing insightful and inspirational commentary. For example, The Register picked up the last two press releases we did, including NVMdurance Aviator, with some insightful commentary that demonstrates their deep knowledge of the flash storage industry and the value we bring. Some people say you are your brand, what is your own take on that, and how do you engage with social media / which platforms have you found work best for you? I agree with this. Companies and products don’t not represent themselves, people have to talk about them. In my previous roles I was not particularly active in social media (one of the benefits of a large company is they have departments of people doing this), but I am taking a much more active role at NVMdurance. I am growing fond of Twitter, as it is easy to connect with your network and keep up with relevant information in real time. I of course, follow Irish Tech News!